Valley Metro Regional Public Transportation Authority helped people make connections everyday, but during the month of February, the transportation leader wanted to encourage trial rides among a new demographic: young, working adults with long commutes. 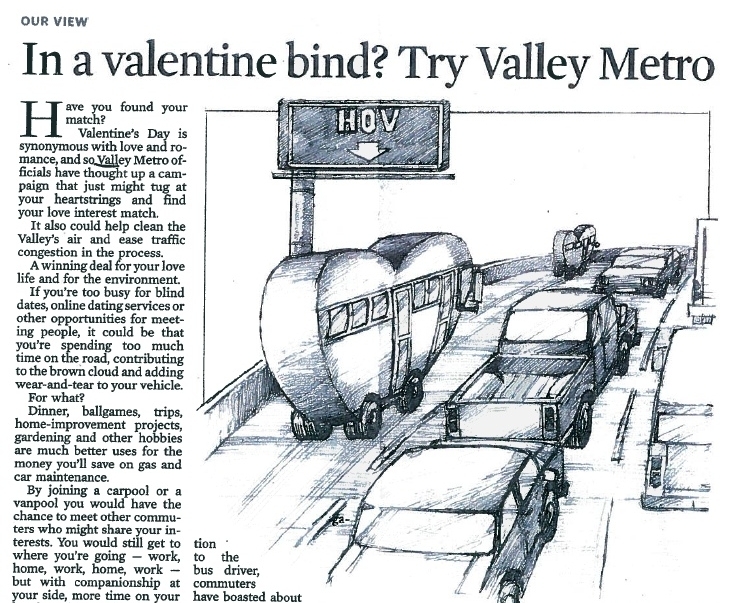 An integrated campaign leveraged the Valentine season (which coincided with seasonal air pollution) to encourage commuters to show a love for clean air and less traffic by sharing the ride, while potentially finding personal benefits, too. Media relations shared heart-moving stories from real riders about the many types of “connections” formed by using public transportation — from new friendships, to business deals, to couples who met and found love on the city bus. Advertising drew the public to a campaign website with instruction about how to match up with bus routes, vanpool services, or carpoolers who had similar commutes. A promotional event offered a taste of how to use public transit as singles went speed dating on a city bus (and rotated partners at each bus stop). The campaign was so successful, it was repeated three times and won an “AdWheel” award from the American Public Transportation Association for best campaigns on a shoestring budget. Singles from an online dating site boarded an actual city bus to speed-date as the bus traveled a popular business and entertainment route. Singles changed seats at each bus stop — potentially meeting someone new while learning a route. Reporters (print and broadcast) rode along to capture the excitement and used the event as a backdrop for the evening’s weather forecast, too. A special proclamation by the Governor kicked off the month-long promotion with credibility and influence — leading to a full-page, positive editorial from the state’s largest daily news outlet that captured all key messages. The ability to identify and insert real life bus and carpool users into news stories humanized the campaign and made messages more relevant. Testimonials became news features for print, broadcast, and business media.